Exacerbating congestive heart failure describes heart failure that is worsening. There are a number of symptoms that might suggest the problem is getting worse and a number of causes that may be responsible. If you can identify any of these signs, then you should seek to change the responsible behaviors as soon as possible. The term ‘heart failure’ might sound like the heart has stopped working entirely but this is actually not the case. Rather, this is a common problem that affects around 6 million Americans with 670,000 new cases diagnosed each year. What CHF actually describes is a weakening of the heart. This means that the power it has to pump blood around the body has been reduced and therefore the blood and oxygen move around the body at a slower rate. This can result in the chambers of the heart enlarging in order to hold more blood to pump or it might cause them to become stiffer and thickened to keep the blood moving. The danger is that the muscle walls in the heart might eventually grow even weaker and therefore be unable to maintain circulation. At this point, the kidneys can respond by causing the body to retain fluid and salt which might build up in the arms, legs, ankles and feet. 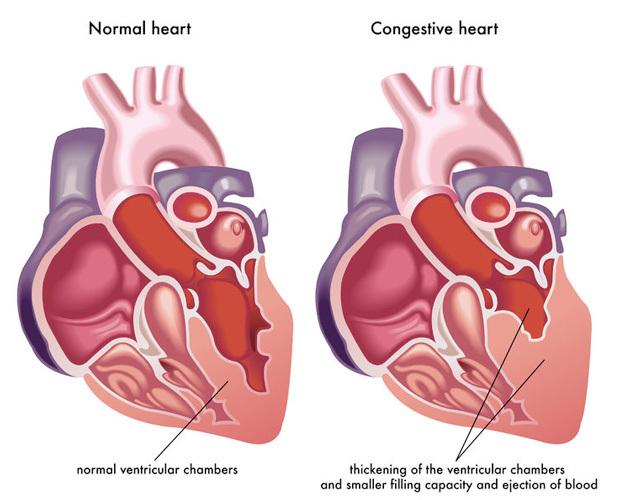 The body thus becomes ‘congested’ and hence the term ‘congestive heart failure’ is used to describe this condition. Congestive heart failure is caused by a number of things and sometimes multiple factors may contribute. Coronary artery disease, heart attack or cardiomyopathy can all damage the heart. This can be the result of misfortune meanwhile, of poor lifestyle choices (lack of activity, drinking and smoking), of infection or of drug abuse. Other conditions like thyroid disease and kidney disease can also ‘overwork’ the heart resulting in eventual congestive heart failure. Congested lungs – Here the lungs flood with fluid which can make it difficult to breathe and especially when lying flat. This can also cause a dry hacking or wheezing cough. Fluid retention – If you notice your ankles, legs and abs (edema) beginning to swell then this can also point to congestive heart failure. This may also cause frequent urination and uncomfortable bloating in the stomach. Rapid heart rate – This is caused by the heart working faster to try and pump blood around at the normal rate despite having less force behind each pump. The heart rate is also more likely to be irregular. Dizziness, fatigue and weakness – This can be the result of less blood reaching the organs, the muscles and the brain. Eventually this can lead to serious light-headedness and essentially symptoms of oxygen starvation. There are two main types of heart failure, the names of which you will recognize if you’ve ever had your blood pressure taken. These are ‘systolic’ and ‘diastolic’. As with a blood pressure reading, systolic refers to the point at which the heart rate is contracting. If the contraction lacks force, then the CHF is called systolic. Meanwhile, diastolic dysfunction describes what happens when the ventricles aren’t able to relax properly between each beat of the heart. This means less blood enters the heart to fill and once again causes less blood to be circulated efficiently around the body. Exacerbating congestive heart failure then simply means that the problem is getting worse and there are a number of mechanisms through which this can happen and a number of signs that can provide warning. This can then exacerbate the condition in a number of ways, essentially causing the common signs of CHF to worsen. Thus you may notice a worsening mental condition along with confusion, severe shortness of breath, leg swelling, fatigue and rapid weight gain. Key to recognize here is that every patient and every illness is unique. Different people will thus react I slightly different ways and it’s important to use your knowledge of yourself and of your own condition to identify what is normal and when there is cause for alarm. Basically, once you notice any of the symptoms associated with CHF getting worse, look at the common exacerbating factors and identify if any may be responsible. It’s then simply a matter of altering your lifestyle accordingly; of taking measures to lower your blood pressure, of reducing alcoholic intake or of getting treatment for infection. Very helpful, clear information. Thank you!